Accidental ingestion of foreign bodies is common in patients with altered mental status. Course of these foreign bodies can range from spontaneous uncomplicated passage from GI tract to perforation of intestine. Intoxicated patients and Morbid obese patients with obstructive sleep apnea will have delay in realization of complications secondary to foreign body ingestion and will have increased morbidity . 70 year old lady with BMI of 51, history of obstructive sleep apnea, COPD, Hypertension ,Diabetes presented with gradual worsening of left upper quadrant pain from 3 days. She had history of mild fever and few episodes of non bilious vomiting. She did not recollect any event that precipitated this abdominal pain. We noted there was tenderness and localized guarding over left upper quadrant and appeared septic. CT scan of abdomen revealed inflammatory mass in left upper quadrant and a radiopaque foreign body next to the mass. 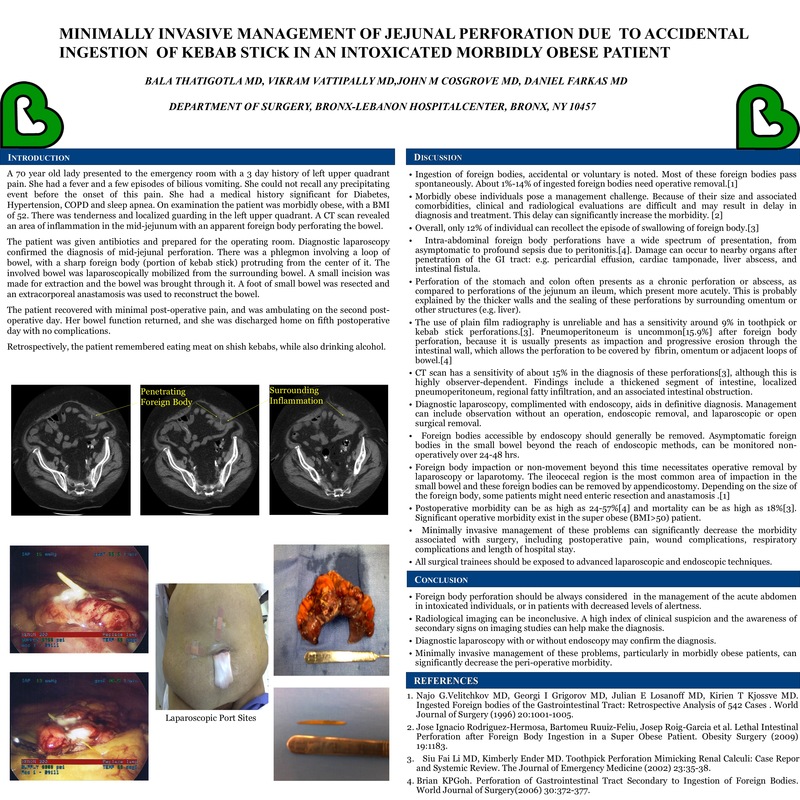 We did diagnostic laparoscopy and identified phlegmatous mass over left upper quadrant, with abscess, and toothpick with sharp ends peforating mid jejunal loop.We did laparoscopic resection of perforated segment of midjejunum ,primary anastomosis and drainage of intraabdominal abscess . Postoperatively on repeat questioning she vaguely recoIlected ofaccidental ingestion of kebab stick, while drinking alcohol. Laparoscopic management of this complication lead to faster recovery of this morbidly obese, diabetic and hypertensive patient without any morbidity. Foreign body perforation should always be considered while evaluation of acute abdomen in patients with history of intoxication and in patients at risk of decreased level of alertness as seen morbid obese patients with obstructive sleep apnea. Our patient had both of these risk factors. Radiological imaging may miss radiolucent foreign bodies, but careful identification of inflammatory signs will help to suspect underlying pathology. Diagnostic laparoscopy will confirm diagnosis. Laparoscopic management of these complications in morbid obese patients will help in faster recovery and less morbidity.